1 4-ounce package of Goat cheese, room temperature. On a large baking sheet, toss the washed & trimmed asparagus with one tablespoon of the olive oil, 1/2 teaspoon salt and 1/4 teaspoon pepper. Bake for 10-15 minutes or until lightly browned. Set it aside to cool. In a small bowl, mix the Goat cheese, half the green onion and 1 tablespoon of Parmesan cheese. If the Goat cheese isn’t soft enough, microwave it for 5 seconds at a time until you can easily mix it. Split the ciabatta loaf in half and then cut each half open. Brush each piece with the remaining tablespoon of olive oil. 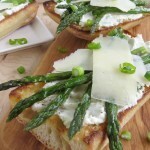 Spread the goat cheese mixture on each piece of bread, followed by 4-6 asparagus pieces, 2-3 pieces of shaved Parmesan and a sprinkling of green onion.